During the first ten or fifteen years of the nineteenth century, the US was swept by religious revivalism and many people were converted in the wake of the newly born religious fervor. The Second Great Awakening spread from its origins in Connecticut and led to the establishment of theological seminaries and mission boards. In the fall of 1819, the brig Thaddeus was chartered to carry the Pioneer Company of missionaries to the Islands. There were seven American couples sent by the American Board of Commissioners for Foreign Missions (ABCFM) to convert the Hawaiians to Christianity. Since work with any non-English speaking people in the US was classified as being foreign missions by most Protestant denominations throughout the nineteenth century, the ABCFM also looked to missions for the American Indians. The Board began its Indian work in 1816, when a few missionaries were sent to the Cherokee. Then, on January 12, 1835, “…one of our elders expects shortly to leave us to join the company of Missionaries to go beyond the Rocky Mountains.” (Hotchkin, Report to American Home Missionary Society) Dr Marcus Whitman had volunteered to go. Upon return from a short investigative trip, Whitman had observed that it was possible to take women over the Rockies, hence he could return, be married to Narcissa Prentiss to whom he was engaged, and take her with him to Oregon. Marcus hoped to find another couple to join them in their Oregon venture. He heard of Henry and Eliza Spalding who were to be missionaries among the Osage people; they had already started for their destination, but Marcus caught up to them and convinced them to join the Oregon missions. The Whitmans and Spaldings formed the forerunners of the ABCFM’s missionary effort in the Pacific Northwest. In April 1836 Whitman’s party set out from Liberty, Missouri. In May they overtook an American Fur Company caravan near the junction of the Platte River and the Loup Fork, in Nebraska. 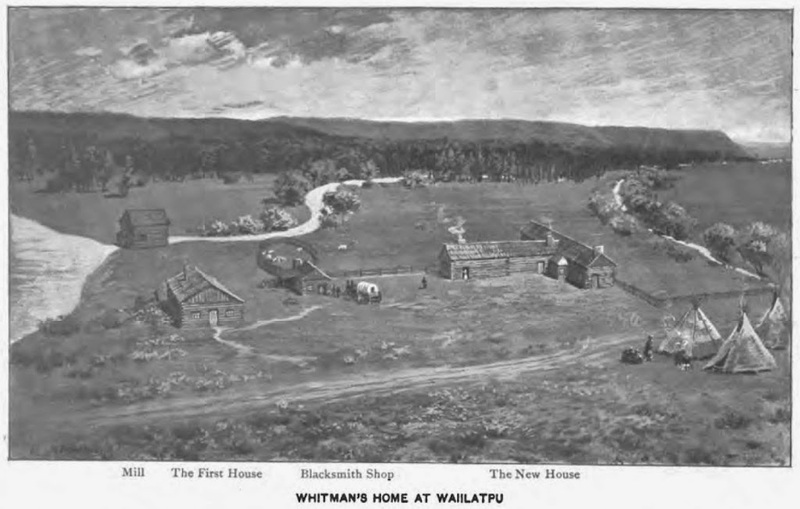 Several Hawaiians lived at the Whitman Mission; a Hawaiian known as “Jack” and another Hawaiian whose name is unknown worked for a fur-trading company called the North West Company and helped Whitman establish the Waiilatpu mission; first they helped to build the Whitman’s home. The Mahis were two of the charter members of the original Oregon Mission Church, being admitted by letter from the Kawaiahaʻo Church at its organization on August 18, 1838. The Cayuse were a semi-nomadic people who were on a seasonal cycle of hunting, gathering and fishing. Whitman introduced agriculture in order to keep the Cayuse at the mission and introduce Christianity. In 1843, Whitman accompanied the first major overland immigration from the US to Oregon, successfully guiding the first immigrant wagons to reach the Columbia River; the mission at Waiilatpu was a major stop on the immigrant trail. Their small expedition was the first to bring families to Oregon by wagon. In 1847, one of those emigrant wagon trains brought measles to the mission. The white children recovered, but the local Cayuse tribe had no resistance. Half the tribe died. Marcus was considered to be a te-wat, or medicine man, to the Cayuse people. His medicines did not work when trying to cure Cayuse infected with measles. It was Cayuse tradition that if the patient died after being treated by the medicine man, the family of the patient had the right to kill the medicine man. On November 29, 1847, eleven Cayuse took part in what is now called the “Whitman Killings” and “Whitman Massacre.” The majority of the tribe was not involved in the deaths of the Whitmans and the eleven others, however, the whole tribe was held responsible until 1850. In that year, five Cayuse were turned over to the authorities in Oregon City and hanged for the crime of killing the Whitmans. The story of the Whitman mission came to an end, however, the legacy of Dr Whitman lived on. Stories of his 1842 ride east to stop the ABCFM from closing some of the Oregon missions became a legend that “Whitman saved Oregon for the Americans”, making it seem that Whitman promoted a manifest destiny for America. The image shows the Whitman Mission. In addition, I have added other images in a folder of like name in the Photos section on my Facebook and Google+ pages. The Sv. Nikolai (a 45-50-foot schooner,) owned by the Russian American Company, set sail from New Arkhangel (modern-day Sitka, Alaska) to explore and identify a site for a permanent Russian fur trading post on the mainland south of Vancouver Island in the Oregon Country. Heavy seas drove the ship aground on the Washington coast just north of the mouth of the Quileute River, forcing twenty-two crew members ashore. Over the next several months the shipwrecked crew clashed with Hohs, Quileutes and Makahs; they lived in hand-built shelters roughly 9-miles up the Hoh River. OK, but what about Hawaiʻi? … Let’s look back. Then, on June 21, 1803, the Lelia Byrd, an American ship under Captain William Shaler, arrived at Kealakekua Bay with two mares and a stallion on board – they were gifts for King Kamehameha. The captain left one of the mares with John Young (a trusted advisor of the King, who begged for one of the animals) then left for Lāhainā, Maui to give the mare and stallion to Kamehameha. During his stay, Shaler asked Kamehameha for one of the chief’s small schooners. Wanting bigger and better, in 1805, Kamehameha traded the 45-ton Tamana and a cargo of sandalwood for the Lelia Byrd,) a “fast, Virginia-built brig of 175-tons.” It became the flagship of Kamehameha’s Navy. That, then, takes us to the Tamana and her fate. Shaler’s agent, John Hudson, sailed the Tamana east to Baja California. Within a year, Hudson sold the Tamana to Russian Captain Pavl Slobodchikov for 150 sea otter skins. Slobodchikov renamed the Tamana to Sv. Nikolai. With a makeshift crew of three Hawaiians and three Americans, Slobodchikov sailed the newly-named Sv Nikolai back to Hawaiʻi, and later returned to New Arkhangel (Sitka, Alaska) in August 1807 where the boat served the Russian fur traders along the Northwest Coast of North America. At the time, the Northwest was unsettled territory. To bypass hostile Native Americans in the Northwest, the Russian American Company contracted with American ships to carry Russian fur traders to California. Under Nikolai Isaakovich Bulygin, the Sv. Nikolai sailed to explore the coast of Vancouver Island and select a site for a settlement on what is today the Oregon coast. The expedition did not succeed. Near Destruction Island the ship was becalmed and they aimlessly drifted. Then, on November 1, 1808, Sv. Nikolai was pushed onto a rocky reef by a heavy squall. The survivors (including Anna Petrovana Bulygin (Captain Bulygin’s wife) – reportedly the first western woman to set foot in Washington state (Cook & Black) were crossing the Hoh River and three of the group, including the captain’s wife, were captured. The rest of the crew then followed the Hoh River inland. They spent the winter in the valley, foraging for food and constructing a boat which they hoped would take them down the river and out to the freedom of the ocean. In February 1809, they attempted to leave in their new boat, but at the mouth of the river it capsized. All the rest of the crew was taken captive. They lived in captivity for about 18 months. A monument was constructed on Upper Hoh Road to commemorate the 1808 shipwreck of a Russian sailing vessel near Rialto Beach. It was created to remember the lives lost when the Russian brig Sv. Nikolai (formerly owned by King Kamehameha and known as the schooner ‘Tamana’) beached in heavy squalls along the Pacific coast of the North Olympic Peninsula. 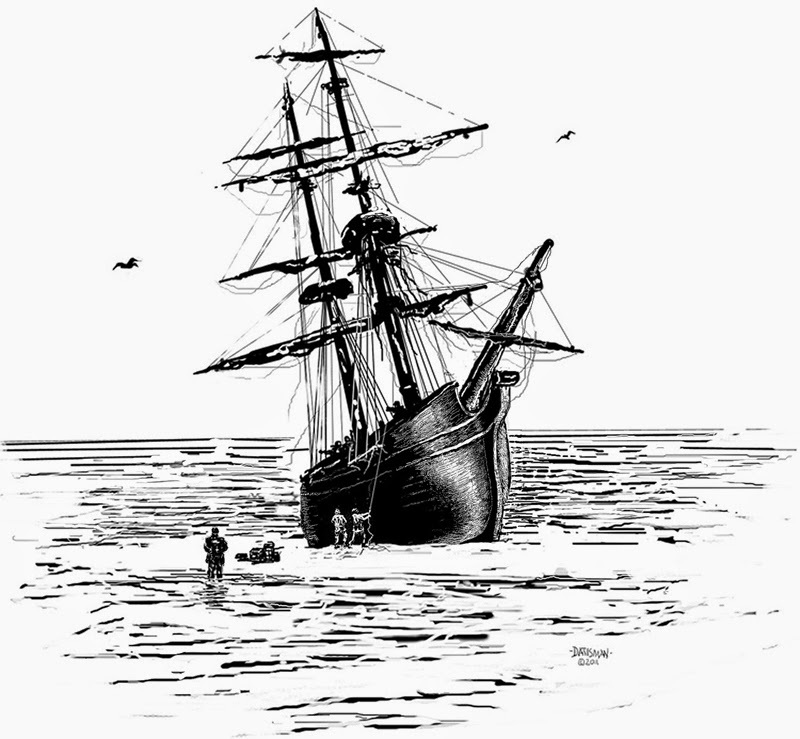 The image shows a drawing of the Sv Nikolai aground (AssocOfWashingtonGenerals.) In addition, I have added other images in a folder of like name in the Photos section of my Facebook and Google+ pages. Jay P Graves, son of John James Graves (who made his fortune in mining, streetcar and railroad on the continent) purchased about 1,000-acres of land in 1904 and started Waikīkī Ranch. Like others with means in the day, he built a mansion; it was designed by architect Kirtland Cutter. The Olmstead Brothers of Boston designed the gardens and water system, and the interiors were done by Elsie de Wolfe, America’s first well-known decorator. Graves wanted the mansion to have a joyous atmosphere, which significantly influenced the Cutter design. The house has beautiful oak and maple floors, and unique molded-plaster ceilings. Newspaper accounts note that a construction camp had been established on the property for the 25-100 workmen who were engaged in construction of the mansion. The camp was complete with a bunkhouse, commissary and mess tent. The 23-room mansion and a number of smaller buildings were constructed at a cost of approximately $175,000 for construction and furnishings in 1911-1913. Waikīkī Ranch had its own water system, which included a storage system of 100,000-gallons, as well as its own hydro-electric system, which provided all of the electrical requirements. The beautiful staircase featured rare tigerwood and benches to sit. The one-piece carved alabaster light fixture was of exceptional size and typical of Cutters details; leaded glass was throughout the home. For nearly twenty-five years Graves continued to make additions and alterations to the property, often with Cutter designs. The Graves entertained many of the nation’s financial leaders and even royalty. Prince Albert, later King Albert of Belgium, was a visitor. Waikīkī Ranch was said to have had the largest herd of thoroughbred Jersey Cattle in the Pacific. The dairy was well known throughout the world with breeding stock shipped as far away as China. The Jersey was bred on the British Channel Island of Jersey. It apparently descended from cattle stock brought over from the nearby Norman mainland, and was first recorded as a separate breed around 1700. The Waikīkī Dairy, founded in 1914, had its own special bottling, with bottles bearing in brilliant red lettering and around the bottom: “For the exclusive use of Waikīkī Dairy”. In 1936, the mansion and remaining ranch property was sold to Mr. & Mrs. Charles E. Marr for $175,000. The Graves moved to Pasadena, California. OK, before you exhaust yourself racking your brain trying to figure out where this 1,000-acre dairy/ranch was in Waikīkī … it wasn’t in Hawaiʻi, it was in Spokane, Washington. But there are Hawaiʻi ties to the place. Obviously the name, Waikīkī Ranch, is one. Graves had visited Waikīkī and noted the meaning of its name, ‘spouting waters.’ Since the ranch had 24-natural springs, Graves thought it an appropriate name for his property. Lots of Hawaiʻi students go to college on the former ranch property. Gonzaga University purchased the Waikīkī Mansion and 9-acres of land in 1964 for $500,000 with the intention of using it for retreats and other events. In 1983, the Waikīkī mansion was renamed the Bozarth Mansion and Retreat Center in honor of area wheat farmer, Horace and Christine Bozarth, who gave a substantial gift to renovate the mansion and pay off the remaining debt. Gonzaga students formed the Hawaiʻi-Pacific Islanders Club and host an annual lūʻau for students and area residents. The 45th annual lūʻau is held Saturday, March 29, 2014. Another Spokane school has Waikīkī Ranch ties; the ranch originally included the land on which Whitworth University is presently located. The Whitworth Hawaiian Club, Na Puʻuwai o Hawaiʻi (The Heart of Hawai’i), shares food and culture with the Whitworth and Spokane folks at its 44th annual lūʻau, Saturday, April 12, 2014. 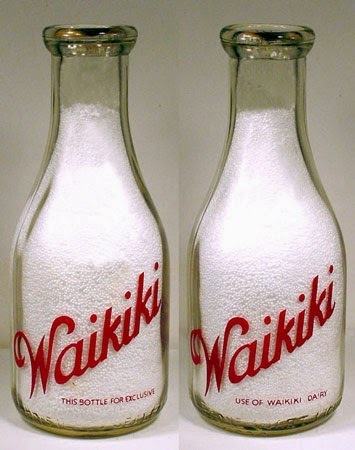 The image shows the Waikīkī dairy milk bottle (ebay.) In addition, I have added other related images in a folder of like name in the Photos section on my Facebook and Google+ pages.